If you’ve been to Torst or Luksus (if you haven’t…go! ), you know Joey Pepper. Bartender, host, homebrewer…how many people have a beer named after them? Joey Pepper does, and that’s why he’s a Beer Hero. Where’s The Beer NY: We first met at Luksus. You were serving the beers that paired with the food dishes, and were excitedly describing them all. You’re also behind the bar at Torst. What’s your official job title? Joey Pepper: My official job title is Torst bartender and Luksus host and beer consultant. WTBNY: How did you first get into beer? JP: My father and his family go down to Rehoboth Beach every summer, which is where the Dogfish Head Brewpub is located. One summer while I was in college, he brought me a six pack of 60 Minute IPA and I was really intrigued. At first I wasn’t sure if I liked it, but by the time I finished the pack I knew I liked hoppy beers. My interests began with IPAs and DIPAs, then slowly turned to pale ales and saisons, and as soon as I found American sours and lambics, I knew I was hooked. WTBNY: And how did you get into beer professionally? JP: I majored in computer science in Boston University, but wanted to pursue my passion. I got a job as a bar back at Pony Bar, then applied for a job at Torst while it was still under construction. JP: I work mostly six nights a week at Torst and Luksus, so I’ll usually grab some ramen for lunch, and try to hang out with friends before my shift. On my days off I’ll make trips to my favorite local breweries or work on my homebrews. 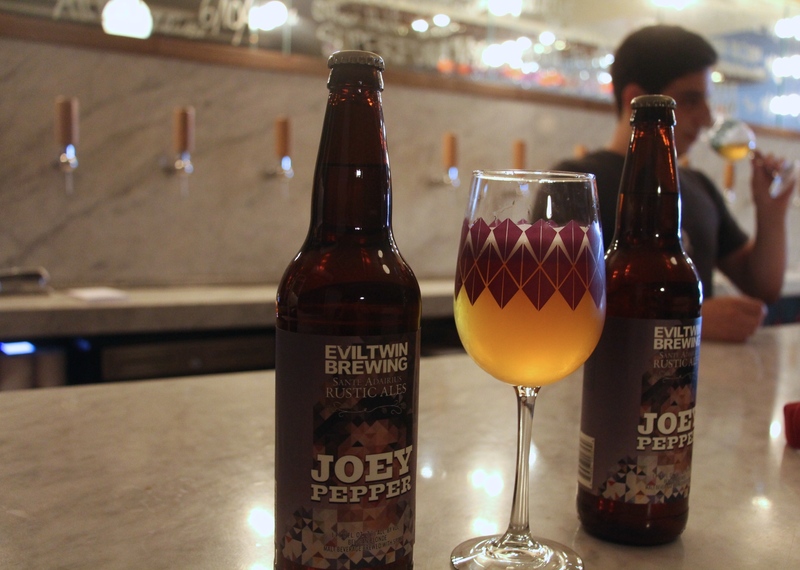 WTBNY: You have a beer named after you (Evil Twin’s Joey Pepper, a Belgian Blond). How did that come about, and how do you like it? JP: It all started at Hill Farmstead last year where Tim from Sante Adairius, Jeppe Jarnit-Bjergsø, and myself got to hang out and drink some amazing beer together. It was clear from the first few minutes of talking that we got along really well and would hopefully collaborate on something in the future. When that time finally came, they decided to name the beer after me and let me formulate the recipe with them. We wanted to brew something that wasn’t really in Evil Twin’s portfolio and still include a “pepper” element, so we did a Belgian Blonde ale with white peppercorns and brettanomyces claussenii for bottle conditioning. It’s not my go-to style, but I really enjoy drinking it. WTBNY: And you just got back from California working on a variant of Joey Pepper? JP: Jeppe and I were at Sante Adairius (Capitola, CA) working on a barrel-aged version. The beer will be aged 3-6 months in wine barrels. 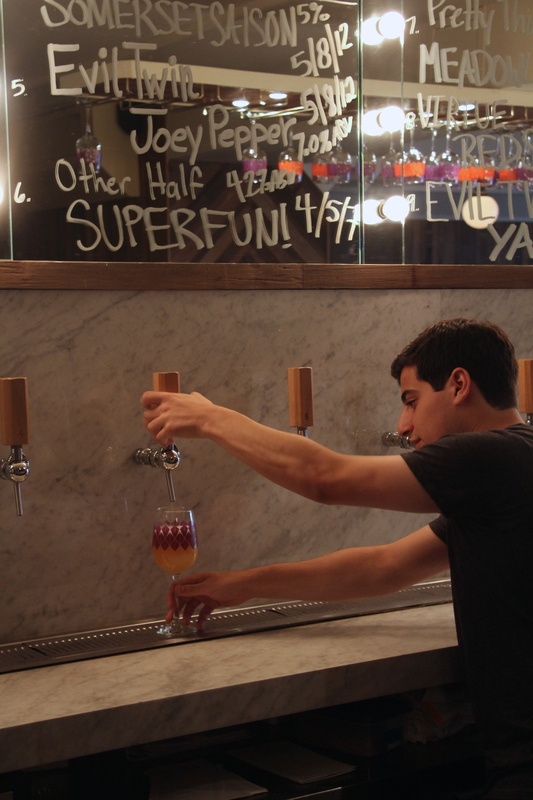 WTBNY: Torst/Luksus has a great rotating draft list, and an impressively big bottle list. Have you tried most of the stuff? JP: I’ve tasted pretty much everything we have to offer. Anything that’s new or expensive/obscure we’ll taste together at a staff meeting. WTBNY: Other than Evil Twin, what new beers/breweries are you most excited about? JP: I’m very excited that Tired Hands is opening up their production facility early next year, those guys are doing great things. My friends out at Sante Adairius just celebrated their 2nd anniversary and are brewing some amazing sour-style saisons. I also really enjoy what I’ve tried from de Garde and Side Project. WTBNY: Is there a beer/brewery you’re dreaming of having? JP: I’m a huge fan of vintage fruit lambics from Cantillon and Drie Fonteinen, so anytime I stubble across one of those I geek out pretty hard. WTBNY: What’s your take on the craft beer/bar community in NYC? JP: It’s pretty amazing how much the scene has grown during the short time I’ve been working in the craft beer industry. It was only a few years ago that people would talk about four or five bars in NYC to go to for a good craft selection. 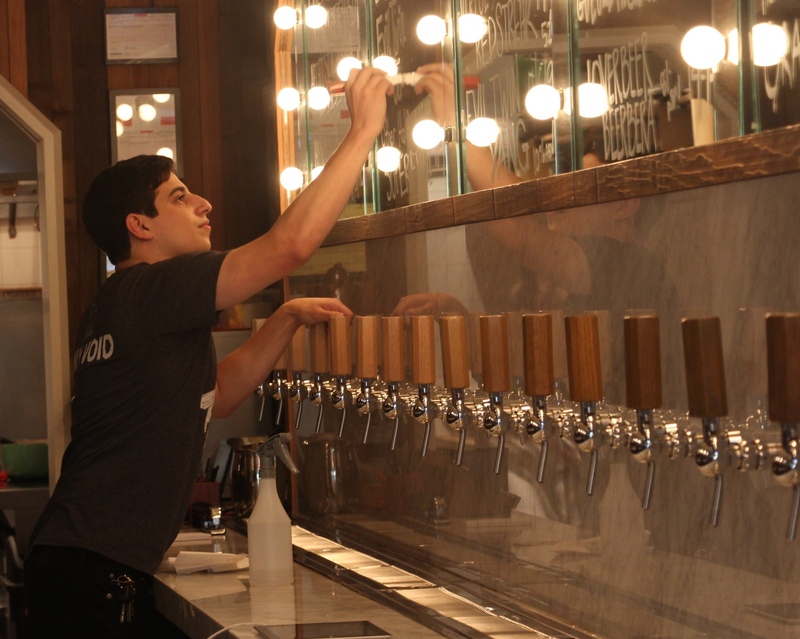 Now almost every neighborhood has a craft beer bar or restaurant with a well curated draft list. WTBNY: Anything exciting coming up at Torst/Luksus? JP: We are planning on doing a Willow’s Family Ale event when batch two of the American Sour Ale is ready. Heath Glover is a good friend of ours and we’re excited to debut his beer in NYC. Visit Joey at Torst and Luksus and find his beer in bottles and on tap throughout the city! August 18, 2014 in Bars, Beer, Interviews.